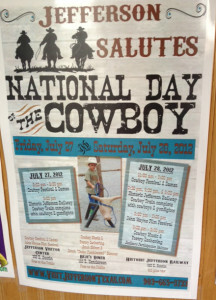 The National Day of the Cowboy kicks off on Friday July 27, 2012 at 6PM in the evening. 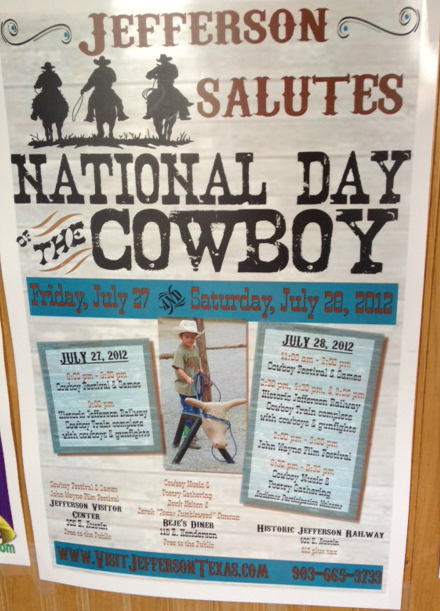 A cowboy festival and games are only some of the events planned. At 9pm Friday jump aboard the Historic Jefferson Railway for a train ride with cowboys just itching for a gunfight look out, there just might be some gun slinging going on! Visit the Jefferson Visitor Center for more information. On Saturday July 28, 2012 more festivities and games will be getting underway from 11AM thru 2PM. If you missed the train ride on Friday night you’ll get more chances to catch a ride at 2:30-4:30 or 9:00PM. Be forewarned though keep your head down or you just might get caught up on the wrong side of a gunfight right on the train. Make sure to throw your hat in with the right side of the cowboy fighting. If you’re looking for a little cool afternoon relaxing, then maybe a film festival featuring one of the greatest cowboys of all time; John Wayne runs from 2:00 to 5:00 PM at the Visitors Center building. These movies are FREE by the way, doesn’t get any better than that. Also Saturday from 5:30 to 8:30 PM mosey on over to Beje’s Diner for some FREE Cowboy Music & Poetry featuring Buck Helton and Derek “Texas Tumbleweed” Duncan. I bet Beje has an appropriate menu planned just for the evening at a good price. Not many Diners can offer you a good meal and Free entertainment. The only thing we ask of you is that when you enter our bed and breakfast to hunker down for the night; is that you take your spurs off before entering. 🙂 Our hardwood floors just couldn’t take it. This entry was posted in Entertainment, Special Events by Tammy D. Bookmark the permalink.